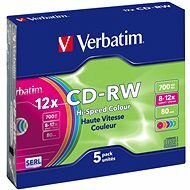 Verbatim's top-quality rewritable CD-RW discs for the ultimate in recording quality, now in a multi-colour set that lets you more easily organize your data. The advanced SERL technology offers maximum stability and reliability of the writing layer. Each disc has a standard capacity of 700MB (80 min.) and supports up to 4x write speeds. The rewritable CD will be a great help if you frequently need to record temporary or new data. The disk can be overwritten at least 1000x. Includes five discs in SLIM boxes. For shipping to other EU countries visit this page Verbatim CD-RW 4x COLOURS 5pcs in a SLIM box. 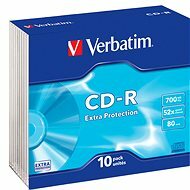 Für Versand nach Deutschland, besuchen Sie bitte Verbatimerbatim CD-RW 4-Farben 5 Stk in einer SLIM box. Chcete doručit zboží do Česka? Prohlédněte si Verbatim CD-RW 4x COLOURS 5ks v SLIM krabičce. Chcete doručiť tovar na Slovensko? 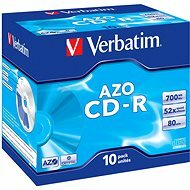 Prezrite si Verbatim CD-RW 4× COLOURS 5 ks v SLIM krabičke. Für Versand nach Österreich, besuchen Sie bitte Verbatimerbatim CD-RW 4-Farben 5 Stk in einer SLIM box. Magyarországra történő kiszállításért tekintse meg ezt a termékoldalt: Verbatim CD-RW 4x, COLOURS 5 db - SLIM tokokban.